ireland Halloween originated in Ireland over 2,000 years ago Ireland is typically believed to be the birthplace of Halloween. Halloween has variously been called All Hallows’ Eve, Witches Night, Lamswool, Snap-Apple Night, Samhaim, and Summer’s End. 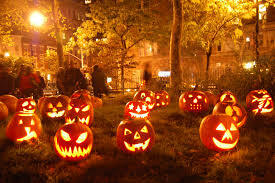 Halloween was influenced by the ancient Roman festival Pomona, which celebrated the harvest goddess of the same name. Many Halloween customs and games that feature apples (such as bobbing for apples) and nuts date from this time. In fact, in the past, Halloween has been called San-Apple Night and Nutcrack Night. Because Protestant England did not believe in Catholic saints, the rituals traditionally associated with Hallowmas (or Halloween) became associated with Guy Fawkes Night. England declared November 5th Guy Fawkes Night to commemorate the capture and execution of Guy Fawkes, who co-conspired to blow up the Parliament in 1605 in order to restore a Catholic king. The average American will spend $66.28 on Halloween in 2010, totaling $5.8 billion The National Retail Federation expects consumers in 2010 to spend $66.28 per person—which would be a total of approximately $5.8 billion—on Halloween costumes, cards, and candy. That’s up from $56.31 in 2009 and brings spending back to 2008 levels. In 1970, a five-year-old boy Kevin Toston allegedly ate Halloween candy laced with heroin. Investigators later discovered the heroin belonged to the boy’s uncle and was not intended for a Halloween candy. In 1974, eight-year-old Timothy O’Bryan died of cyanide poisoning after eating Halloween candy. Investigators later learned that his father had taken out a $20,000 life insurance policy on each of his children and that he had poisoned his own son and also attempted to poison his daughter. Children are more than twice as likely to be killed in a pedestrian/car accident on Halloween than on any other night.